Mario Kart 8 has over a 50% attach rate. That's insane. A good game with an excellent DLC getting a high attachment rate is insane? Mario Kart Wii selling 35 million units, that's insane IMO. I'd put a lot of weight on the "buy 1, get 1 free" launch promotion. So if I got this right the good news is that Nintendo is back in profit and Wii U is meeting sales forecasts and the bad news is that 3DS sales are way down compared to last year, although New 3DS should help remedy some of that before the financial year ends. The Mario Kart attach Rate is amazing and sad all at the same time. It sort of encapsulates the issues that the Wii U has been having thus far. Beyond the Wii U being stuck in its rut the company is doin incredibly well. This just makes me even more confused about the stock issues. Did Nintendo really only plan on selling a handful of these? I mean, 5.7 million is a success for sure, but there's over 60 million users in the current gen Nintendo ecosystem. Surely Nintendo could have anticipated a higher demand? Skylanders and DI figurines have like a hundred million sales. This is a lucrative market and Nintendo merch is very popular, even among those that don't have a Wii U/3DS. Iwata is apparently too ill so the meeting is cancelled. 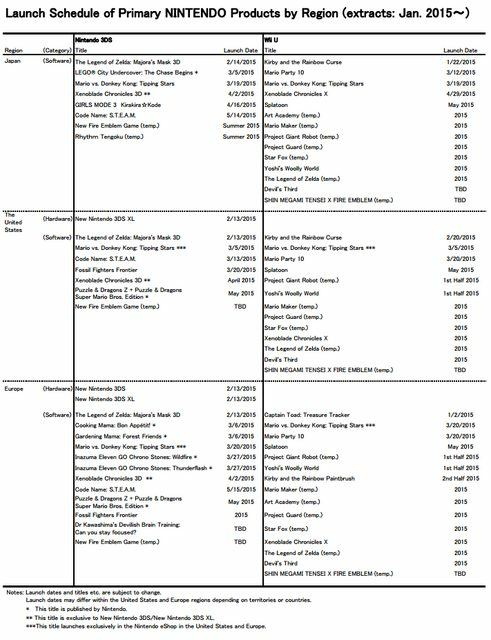 Release schedule on page 7. Project Giant Robot and Yoshi's Woolly World are still 1st half of 2015 in US and Europe. 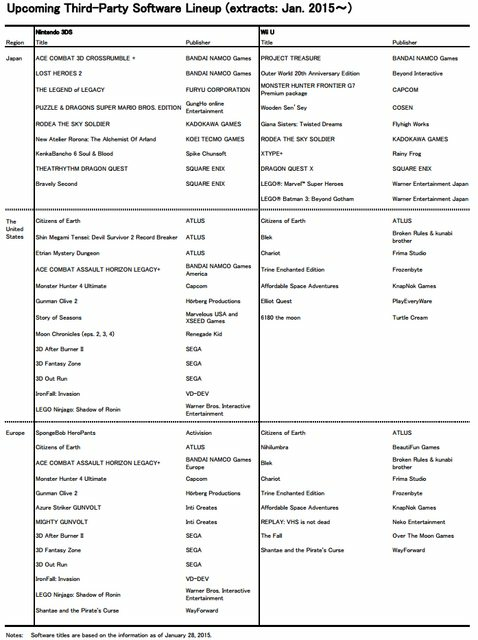 SMT X Fire Emblem is still listed, altbeit TBD. Impressive numbers for Tomodachi Life. Today's priority event was canceled due to health concerns and will be rescheduled at an undetermined date. Quite an unexpected stunt. More as events unfold.. Thanks @WebHead^, didn't see you there! And Mario Maker moved from 1st half (was listed as such in the October listing for NoE). But NoE and NoA now seems pretty synched, apart from Kirby. The US 3rd party listing is straight up embarrassing. Interesting that Devilish Brain Training is still as TBD rather than cancelled, that game came out in the US 2 years ago!